As I said to S yesterday, “One of the best parts about Vegan MoFo is that we eat really well.” Spurred on by my desire to offer up high-quality recipes, I force myself to overcome my laziness and get creative. So far this week, I’ve dug deep into my pantry and fridge; I haven’t had to make any special grocery store trips (other than my weekly shopping on Sunday). Today, though, I ran to the store for a red bell pepper, because I knew this particular dish needed it. 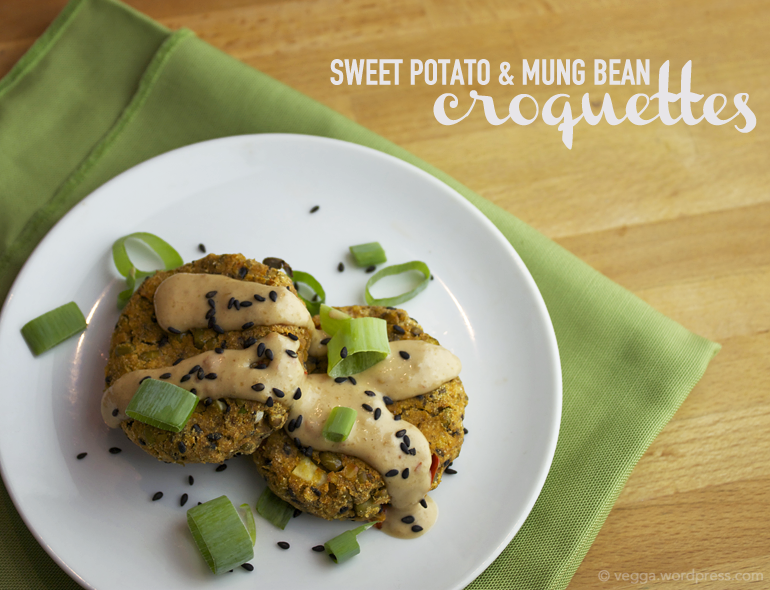 These baked croquettes not only taste amazing, but they feature two nutritional superstars: sweet potatoes and mung beans. The combination offers a one-two punch of protein and iron (and don’t you worry, we’ll be talking about iron soon!). 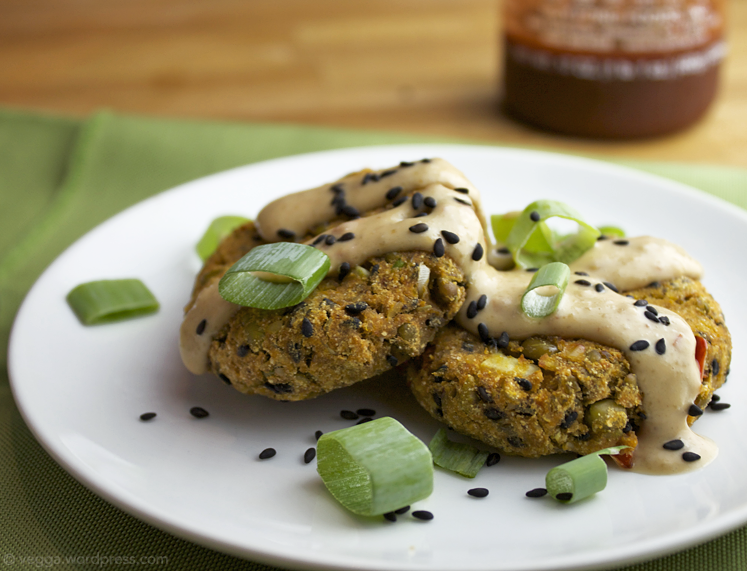 Three of these patties will load you up with 23 grams of protein, 39% of your daily recommended value of iron, 17% of your daily calcium needs, and goodly doses of fiber, potassium, and vitamin C. And that’s not even including the coconut-peanut sauce, a creamy topping that’s a breeze to prepare. And did I mention these are gluten-free if you use a GF tamari or soy sauce? Celiac friends, rejoice! Boil the sweet potatoes for about 15 minutes or until soft. At the same time, either boil or steam the mung beans. You can boil them right along with the sweet potatoes, or if you have a steamer pot set, steam them right on top of the potatoes. (I have a set like this one and that’s what I did.) When the sweet potatoes are soft, drain the pot and set them and the mung beans aside to cool. While the mung beans and potatoes are cooking and subsequently cooling, chop the garlic, scallions, and red bell pepper and set aside. Next, make the sauce by whisking all five sauce ingredients together in a small bowl. Preheat your oven to 375˚ and line a baking sheet with parchment paper or oil it lightly (coconut oil works great here!). When the potatoes and mung beans have cooled a bit, add all the sweet potatoes, all the garlic, and about half the mung beans to a food processor and pulse a few times. Add half the remaining mung beans, pulse again, and then add the remaining mung beans. Process until the sweet potatoes are fully mashed and most of the mung beans are incorporated into the mixture. It’s okay if some of the beans are still whole; you want a nice variation. Transfer the mixture to a large mixing bowl and add the scallions, red bell pepper, sesame seeds, sambal oelek, and soy sauce. Mix until combined using a wooden spoon or plastic spatula. Add 2 tablespoons of coconut flour and mix again. Depending on how much sambal oelek you added, your mixture might need another tablespoon. The mixture should stick together easily but shouldn’t be at all dry—you want it just the tiniest bit sticky. Using your hands, scoop about 1/4 cup of the mixture at a time and flatten it into patties about 3/4″ thick. Spread evenly on the prepared baking sheet. Place in the oven and cook for 15-20 minutes, or until the tops are beginning to brown. At that point, remove from the oven and spray or brush lightly with coconut oil, then broil for another 3-5 minutes, being sure not to burn them. Remove from oven and let sit for at least 5 minutes before serving. Top with coconut sauce, a sprinkle of sesame seeds, and extra scallions if you have ’em. Enjoy! What’s your favorite use for mung beans or sweet potatoes? I LOVE sweet potatoes and these look amazing. Peanut sauce on anything is pretty much gonna be a win for me! Totally agree! I’m a big ol’ sucker for peanut sauce. Sounds delicious, I love all of these ingredients! Hmmm these look great! Can´t wait to try them. If you do, please let me know how they turn out!